traditional recipe w/ real maryland jumbo lump blue crab meat, a touch of mayonnaise & spices, served w/ roadhouse tartar sauce. sweet & hand-cut, twice-cooked & served w/ spicy mayo. can be gluten-free. A classic starter all over the south. A creamy spread of cabot cheddar, Hellmann's mayo & chopped pimentos. Served w/ celery. All-beef hot dogs dipped in a homemade batter of anson mills' organic corn meal. Served w/ Raye's yellow mustard. 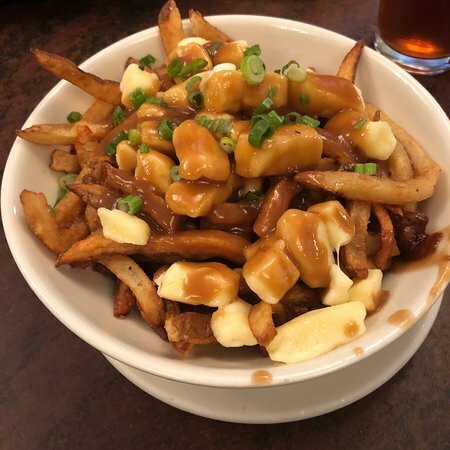 A very classic dish from Quebec, served here at the roadhouse! Hand-cut, twice-cooked fries, loaded w/ wisconsin cheese curds & topped w/ beef gravy & scallions. 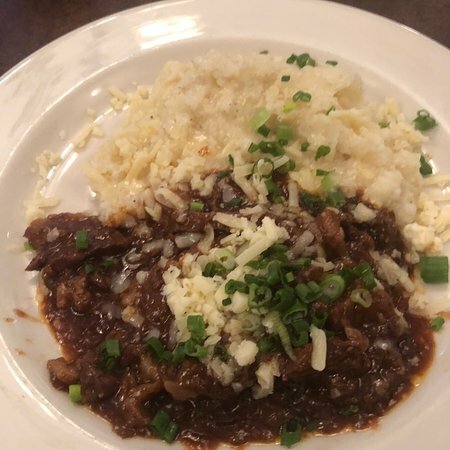 our hand-cut, twice-cooked fries smothered in ancho beef chuck chili & topped w/ grated cabot cheddar. steamed blue hill bay mussels in white wine, cornman farms' heirloom roasted tomatoes, lemon juice, shallots & fresh herbs. cornman farms' roasted red peppers & fresh goat cheese on grilled sourdough, topped w/ fresh herbs. gulf shrimp,‏ sauteed in worcestershire sauce, garlic, lemon, fresh herbs & butter. served w/ grilled sourdough & garnished w/ scallions. Housemade pork & beef meatballs tossed in Alex's red rage BBQ sauce then topped w/ scallions. 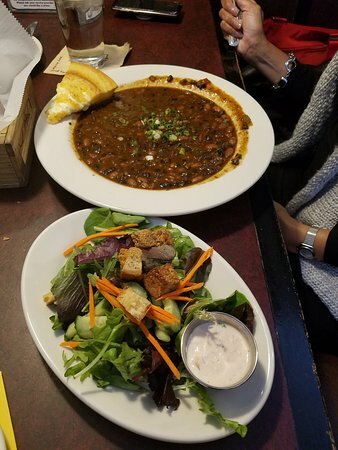 hand-cut cornman farms' pasture-raised beef chuck w/ black beans in ancho chili broth. topped w/ scallions. black beans cooked w/ ham hocks, onions, garlic, cumin & coriander. garnished w/ cilantro, sliced onion & sour cream. potatoes &‏ leeks cooked w/ onions, garlic, celery, vegetable stock & cream. garnished w/ fresh herbs. mixed greens, corn shoots, red onion, carrots, cucumbers, radish sprouts, corn shoots & housemade salt-and-pepper croutons, served w/ your choice of dressing. organic romaine lettuce, really good caesar dressing w/ raw egg aged 2-year wisconsin parmesan cheese & salt-and-pepper croutons. can be gluten-free. fresh local greens sauteed w/ aged goat cheese, local mushrooms, roasted cornman farms' roasted red peppers, leeks & fennel in a brown butter vinaigrette. mixed greens, applewood smoked bacon, salemville blue cheese, red onion, roasted tomatoes & balsamic vinaigrette. thinly shredded kale, dried cherries & pinenuts w/ lemon, extra virgin olive oil & sarvecchio parmesan cheese. mixed greens, beet, red onion & fresh goat cheese w/ red wine vinaigrette. cornman farms' spinach, tossed w/ bacon vinaigrette, red onion, mushrooms, cherries, blue cheese & chopped hardboiled egg. 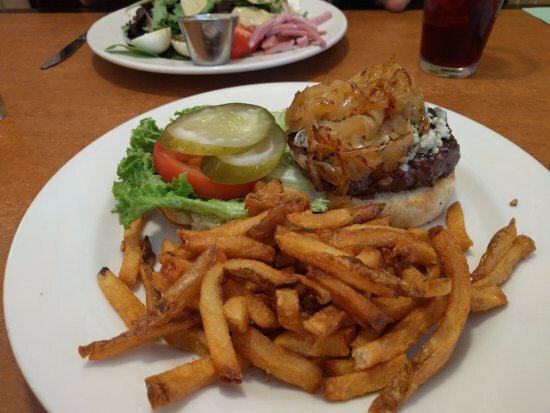 our burgers are ground fresh every day, served w/ hand-cut, twice-cooked fries. pasture-raised beef, dry-aged, grilled over oak, served on a bakehouse onion roll w/ lettuce, onion, tomato & pickles. can be gluten-free, leave off the bread. 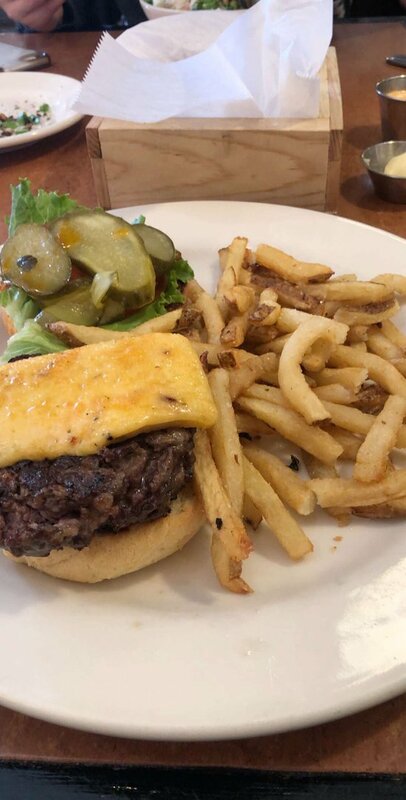 Choose your favorite cheese from our all-American cheese list to add to your burger! pasture-raised beef, dry-aged, grilled over oak, served on a bakehouse onion roll w/ lettuce, onion, tomato & pickles. can be gluten-free, leave off the bread. No meat but plenty of flavor & texture! Spiced w/ roasted garlic, red peppers & onions.Topped w/ avocado salad & fire-roasted new Mexico green chilies, lettuce, onion & pickles on a bakehouse onion roll. Five mini-burgers topped w/ different cheesesa delicious way to try our many great American-made cheeses. Served w/ lettuce, onion, tomato & pickles. Cornman farms'‏ pasture-raised front quarter of beef, pit-smoked then braised'til tender. Served w/ Alex's red rage tomato BBQ sauce & yellow mustard slaw. 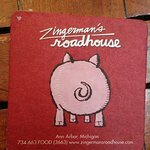 our traditional whole hog seasoned w/ your choice of barbeque sauce on a bakehouse onion roll. served w/ mustard cole slaw. can be gluten-free, leave off the onion roll. Pieces of pit-smoked free-range pasture-raised amish chickens from homer, mi in Alex's red rage tomato BBQ sauce on a bakehouse onion roll. Flour & buttermilk breaded clam strips, topped w/ shredded lettuce, heirloom tomato relish & lots of housemade tartar sauce. Served on a soft Italian baguette from the bakehouse. available oak wood grilled, sauteed, blackened or rubbed w/ zinger man's spicy coffee spice rub; served w/ local mashed potatoes & local greens. all fresh fish is gluten-free. Really good whole catfish from Yazoo city, Mississippi, dusted in organic cornmeal then fried. Served w/ anson mill's grits, southern-style bacon-braised greens, yellow mustard coleslaw, housemade tartar & hot sauce. Beer-battered haddock served w/ housemade tartar sauce, roadhouse yellow mustard slaw & hand-cut, twice-cooked French fries. served w/ anson mills' white corn grits & cornman farms' chow chow. macaroni made w/ our bechamel sauce contains onions. housemade bechamel sauce & lots of cabot cheddar caramelized w/ martelli pasta. all-out southern comfort food. rustichella pasta caramelized w/ applewood smoked bacon & our housemade southern pimento cheese w/ martelli pasta. want it vegetarian remove the bacon! our buttermilk fried chicken, chopped & tossed w/ housemade bechamel sauce & lots of cabot cheddar caramelized w/ martelli pasta. Ig vella's monterey jack tossed w/ pit-smoked free-range chicken, freshly cut corn, new Mexico green chilies & fresh cilantro in our housemade bechamel sauce caramelized w/ martelli pasta. Garnished w/ corn shoots. fresh, handmade goat cheese sauce w/ cornman farms' roasted red peppers, freshly cracked black, green & white tellicherry peppercorns & martelli pasta, topped w/ a zingerman's creamery lincoln log crispy round. house cured guanciale, garlic, herbs, wine, cream, parmesan & egg tossed w/ our martelli pasta. garnished w/ cornman farms' pea shoots. Organic stone-ground grit cakes, heated on the wood fired grill, topped w/ cabot cheddar, cornman farms' roasted peppers, caramelized onions, fresh corn & fire-roasted new Mexico green chilies, all sauteed w/ cider vinaigrette. Topped w/ corn shoots. really wild wild rice sauteed w/ mushrooms, roasted vegetables, dried cherries, fennel, roasted red peppers, scallions, herbs & brown butter vinaigrette. anson mills' farro piccolo sauteed w/ fresh herbs, white wine & local mushrooms. cooked like a risotto & finished w/ cream & sarvecchio parmesan cheese. 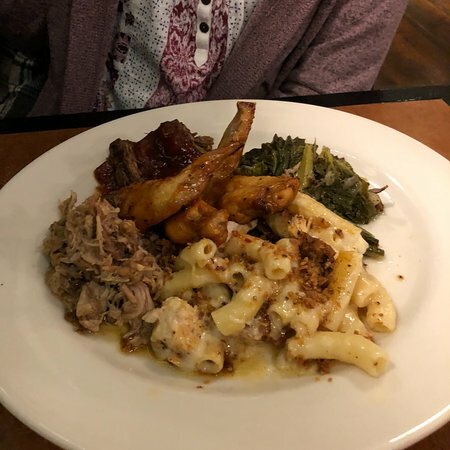 we're bringing a southern tradition right here to an arbor, you choose your meat & three sides to round out your plate. 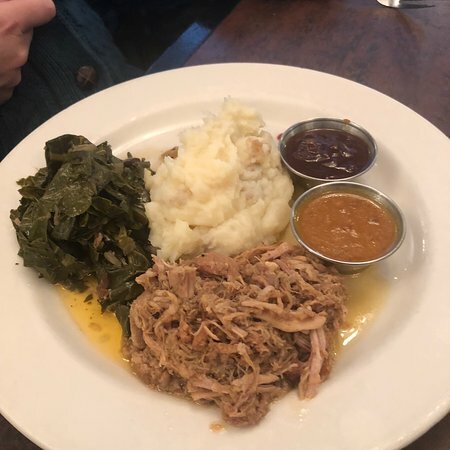 & three sides: mashed local potatoes, hand-cut fries, bacon-braised greens, carolina gold rice, yellow mustard slaw, sauteed spinach, anson mills grits, chow chow & roasted vegetables. sirloin, tenderized,‏ lightly breaded, fried & smothered w/ chicken gravy. 6 ounces‏ flank steak marinated w/ worcestershire sauce, shallots & garlic, best served rare. cornman farms' steaks are pasture raised old breed of cattle. all of the steaks are dry aged to approx. 5 weeks, which creates a complexity of flavor achieved no other way. amish free-range chicken dipped in a black pepper-spiced buttermilk batter then deep fried. served w/ mashed local potatoes topped w/ housemade chicken gravy & mustard coleslaw. substitute a breast for any piece for a 4 charge. 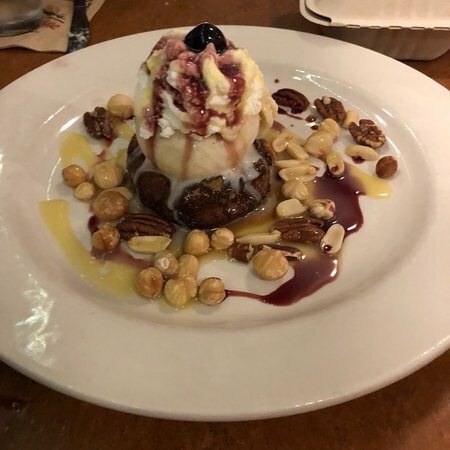 can be gluten-free, just ask your server. pasture-raised hamburger w/ a mushroom bordelaise, served w/ mashed local potatoes & sauteed spinach. rosemary marinated grilled boneless ribeye served atop thinly shredded kale, pinenuts & dried cherries w/ lemon, extra virgin olive oil & sarvecchio cheese. Tender sirloin steak braised w/ onions, garlic, mushrooms, white wine, beef broth, dijon mustard, cream & Hungarian paprika then tossed w/ martelli pasta. braised beef shanks w/ carrots, celery, onion, mushrooms & herbs w/ lots of red wine. served w/ mashed local potatoes. Un barbecue dans un cadre confortable. La cuisine y est toujours délicieuse. Le service est de première classe. Les tarifs sont un peu élevés, nous enregistrer car c'est un régal. Immense portions. Délicieux. Toujours plein à craquer. Il y a beaucoup de places pour s'asseoir. La ligne se déplace rapidement même lorsque la porte à côté. Holy son super consommation ! J'étais déjà allé dans cet hôtel plusieurs fois. La nourriture est de bonne qualité. L'attente peut être longue. Le personnel est sympa. J'aimerais beaucoup quand on peut manger dehors. Le serveur était génial. Très efficaces. La nourriture était bonne. J'ai pris un hamburger, même s'il est un peu trop cher pour ce qu'il est, cuisiné comme je l'avais demandé. Excellent séjour. 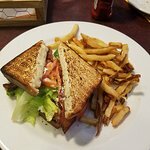 La nourriture était bonne, le service est bon, l'atmosphère est très bon. Endroit animé, donc mieux réserver si vous le pouvez. Super endroit ! Obtenez des réponses rapides du personnel et personnes ayant visité le Zingerman's Roadhouse.